Describe in great detail your favorite room, place, meal, day, or person. You can do this in paragraph form. Now cut unnecessary words like articles and determiners (a, the, that) and anything that isn’t really necessary for content; leave mainly nouns, verbs, a few adjectives. Cut the lines where you see fit and, VOILA! A poem! A hole I could hold in my hands. Here is this beautiful place, a site of a novel (theoretically in progress, though actually resting, like dough) from our visit in 2011. I dream of returning there to stay and work on this project when the trees are all leafed. The arch is behind the Musee, a modern-ish town is directly behind the limestone wall/cliff. I’m standing on the path to the fontaine (the river source). There is another photo from this walk on the cover of my poetry chapbook 2011. Musee de Petrarque on right. The Sorgue bubbles by, twisting this way, then that. Musée de Petrarque stands stately amid garden and tall stretched poplars. from a hole I could hold in my hands. Which version do you prefer? The ‘brevity is an art’ version or the ‘extended version’? 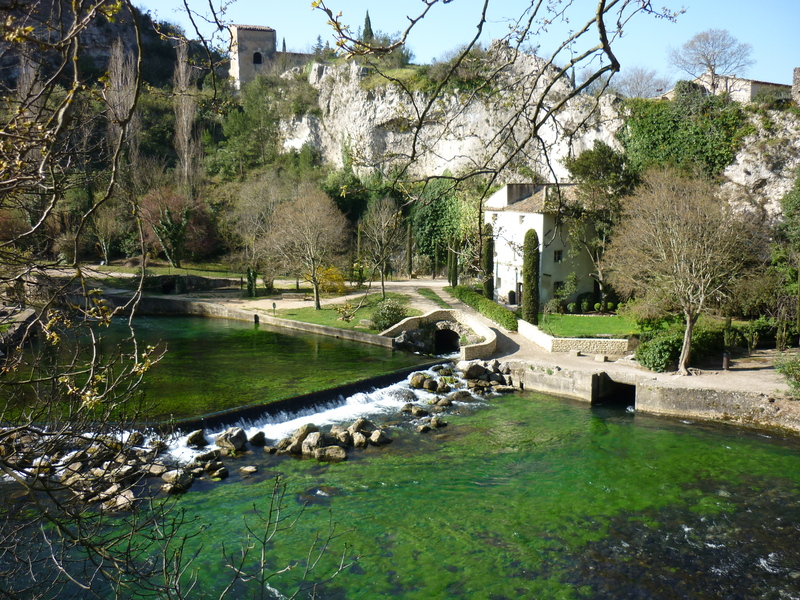 I expect WordPress to link to a complete blog post about our visit to Fontaine de Vaucluse below (entitled Magic Fontaine); you may be interested in reading that post, as well. 402,243 visitors so far. Welcome back again soon!